From the Antipodes, from Terra Australis de Spiritu Sancto, we come as pilgrims ad limina apostolorum, to the Tombs of the Apostles. The old map on the third loggia of this Apostolic Palace has Australia marked simply as Terra Incognita. But our land is no longer unknown to you, and its “joys and hopes, griefs and anxieties” (Lumen Gentium, 1) are intimately known to us as Pastors. All of these we bring to you now, confident that you have come to know not only our land but also its people in all their diversity. The land may be distant, but we know the people are close to your heart. 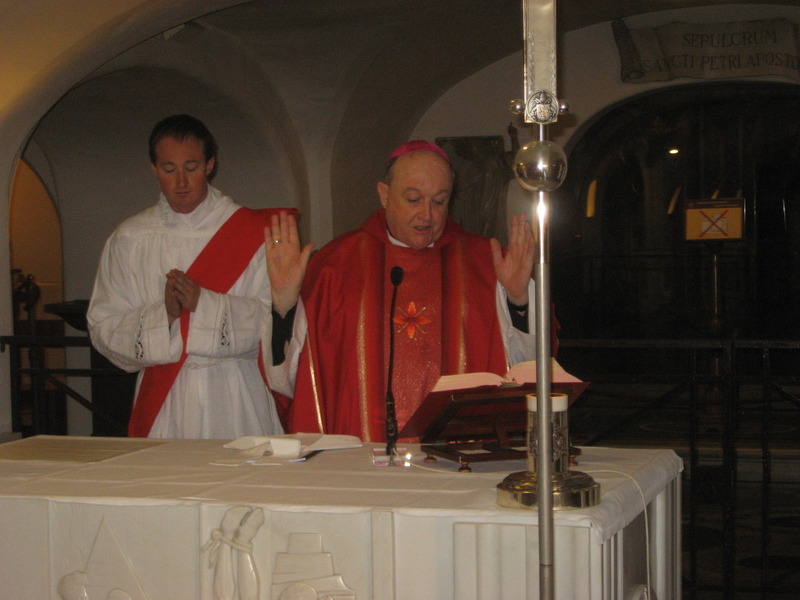 In this our first meeting with you in Rome since your election as Universal Pastor, we look back across the years since our last Ad Limina visit in 2004. Those years have been marked by two great graces given by God to the Church in Australia. The first of these was World Youth Day in Sydney in 2008, when it was our joy to welcome you to our shores. The second was the Canonisation last year of the first Australian to be recognized as a Saint, Saint Mary of the Cross MacKillop. Then it was you who welcomed us and a host of Australian pilgrims who came to Rome to praise God for this remarkable woman who is now Australia’s gift to the universal Church. Now we ask: How are we to build upon these two great graces in order to build the future of the Church in Australia at a complex and challenging time? Different voices are heard among us, voices that interpret the past differently – especially the Second Vatican Council – and voices therefore that understand differently how we should move into the future. In such a situation, the ministry of unity which is ours as Bishops – and supremely yours as Pope – is not always easy. Often it is the way of the Cross. In coming to Rome, we recommit ourselves to this way, the way of Peter and Paul, the way of Easter. We also express our gratitude to you for your faithfulness to the ministry of communion which belongs to Peter. By your self-sacrificing service, you have strengthened us, your brothers, and for this we give thanks to God. May the Lord preserve you and give you life! will seek to contemplate the face of Jesus and to listen to his voice at a new depth, in the belief that only he can lead us into the future, that only he can make us one in faith, in hope, in love. Through this year, we will implore a new sending of the Holy Spirit, who alone can breathe new life into the Church. Holy Father, we entrust the “Year of Grace” to your prayer and we seek your Apostolic Blessing upon the Church in Australia, that we may be able to build upon the graces of recent times and work together to build the future with the words of the Psalmist in our hearts: “If the Lord does not build the house, in vain do the builders labour” (Psalm 127:1).